NAP (Asn-Ala-Pro-Val-Ser-Ile-Pro-Gln, single amino acid letter code, NAPVSIPQ), an eight amino acid neuroprotective peptide derived from activity-dependent neuroprotective protein (ADNP), exhibits some structural similarity to activity-dependent neurotropic factor-9 (ADNF-9; Ser-Alal-Leu-Leu-Arg-Ser-Ile-Pro-Ala, SALLRSIPA). Both peptides are also active in the all D-amino acid conformation, termed D-NAP and D-SAL. Original results utilizing affinity chromatography coupled to mass spectrometry identified tubulin, the subunit protein of microtubules, as the major NAP-associating protein in brain. The NAP-tubulin association was found to be diminished in the presence of ADNF-9, D-NAP, and D-SAL, suggesting a common target of neuroprotection. The β amyloid peptide interacts with microtubules, and previous studies have demonstrated protection against β amyloid (25–35) toxicity by NAP and ADNF-9. NAP also inhibits β amyloid (25–35 and 1–40) aggregation. Cerebral cortical cultures derived from newborn rats were used in neuronal survival assays to test the activity of both NAP and D-SAL against the major Alzheimer's disease toxic peptide β amyloid (1–42). NAP and D-SAL protected cerebral cortical neurons against the major Alzheimer's disease toxic peptide β amyloid (1–42). Maximal protection of both peptides was observed at concentrations of 10-15 to 10-10 mol/l. These findings, together with those of previous in vivo studies conducted in relevant Alzheimer's disease models, pave the path to drug development. Bioavailability studies indicated that NAP penetrates cells and crosses the blood-brain barrier after nasal or systemic administration. Phase II clinical trials of NAP are currently in progress by Allon Therapeutics Inc.
NAP (Asn-Ala-Pro-Val-Ser-Ile-Pro-Gln, single amino acid letter code, NAPVSIPQ, an eight amino acid neuroprotective peptide) is derived from activity-dependent neuroprotective protein (ADNP) [1, 2], a protein that differentially interacts with chromatin to regulate genes that are essential for brain formation and embryogenesis [3–5]. Furthermore, recombinant ADNP is neuroprotective in vitro against severe oxidative stress and neurotoxicity associated with the Alzheimer's disease neurotoxin β amyloid peptide (25–35) . ADNP synthesis and secretion is induced by the neuroprotective vasoactive intestinal peptide [1, 7]. Activity-dependent neuroprotective factor (ADNF) was isolated from conditioned medium of astrocytes treated with vasoactive intestinal peptide that, in turn, was initially found to be associated with embryonic development and brain protection [8–11]. The active core of ADNF, namely ADNF-9 (SALLRSIPA), exhibits structural and functional similarities with NAP [1, 12, 13]. A comprehensive review detailing NAP neuroprotective activity and clinical development  and a short review detailing NAP neurotropism in vitro were recently published . Furthermore, NAP was found to enhance neurodevelopment of newborn apolipoprotein E-deficient mice subjected to hypoxia, suggesting neurotropic activity in vivo . NAP was initially discovered to protect against β amyloid (amino acids 25–35) toxicity in rat cerebral cortical neurons seeded on a bed of astrocytes, and these studies were extended to show that NAP protected against β amyloid (25–35) in neuronal enriched cultures [1, 17]. The primary structure of NAP includes two prolines that confer β sheet breaking characteristics, and NAP was shown to decrease the aggregation of the β amyloid peptide (25–35 and 1–40) . The function and properties of ADNF-9 were recently reviewed . Regarding Alzheimer's disease, ADNF-9 protects against the toxicity of β amyloid peptide (25–35)  and (1–42) . In addition, primary hippocampal neurons from presenilin 1 mutant knock-in mice, exhibiting increased production of amyloid β peptide 42–43 and increased vulnerability to excitotoxicity, were protected by pretreatment with ADNF-9 . The all D-amino acid analogs of NAP and ADNF-9 (D-NAP and D-SAL, respectively) have both been found to exhibit neuroprotective activity . Here, we present data on the novel finding that NAP and D-SAL also protect against β amyloid (1–42) toxicity. The octapeptides NAP and D-SAL were synthesized by Professor M Fridkin and Ms S Rubinraut at the Department of Organic Chemistry of the Weizmann Institute of Science (Rehovot, Israel) and Bachem (Torrance, CA, USA). All peptides were dissolved in distilled sterile water to a concentration of 1 mmol/l and then diluted in water in 1:10 steps down to the required concentration. The β amyloid peptide (1–42) was obtained from American Peptides Company (Sunnyvale, CA, USA). Cerebral cortical cultures derived from newborn rats were used for neuron survival assays. For mixed neuroglial cultures, neurons (300,000 cells/35 mm dish) were seeded on 8-day-old astrocytes prepared as described [1, 21]. Cells were allowed to grow for 1 week at 37°C (10% carbon dioxide) before experiments were performed. Four days after neuronal plating, cultures were given their respective treatment and assayed for neuronal survival after an additional 5-day incubation period. The culture medium was removed and cells were washed twice with phosphate buffered saline. A volume of 1.5 ml of 3% gluteraldehyde (Fluka Biochemika, Steinheim, Germany) in 0.1 mol/l cacodylic acid (pH 7.2; Fluka Biochemika) was added for 2 hours. The cells were then washed with phosphate buffered saline and 2 ml of 0.15 mol/l cacodylic acid (pH 7.2) was added. Neuronal identity was established by morphological criteria using an Olympus CK2 light microscope (Olympus, Tokyo, Japan) with a 40× lens. Fifty fields were counted per dish . The number of surviving neurons was assessed in cerebral cortical cultures derived from newborn rats using 2.5 μmol/l of β amyloid peptide (1–42), a toxin associated with Alzheimer's disease. NAP and D-SAL were used at the following concentrations: 10-16 mol/l, 10-15 mol/l, 10-12 mol/l, and 10-10 mol/l. The peptides protected against neurotoxicity associated with the β amyloid peptide (1–42; P < 0.001). Maximal protection of both peptides was observed at concentrations of 10-15 mol/l to 10-10 mol/l (Figure 1). No differences were observed between NAP and D-SAL in terms of neuroprotection. Cell counts totaled more than 100% of control. This may be because the treatment prevented neuronal cell death that occurred naturally in the cultures (10% to 20%), as previously observed . The eight and nine amino acid peptides (NAP and D-SAL, respectively) provide neuroprotection against β amyloid (1–42). Mixed neuroglial cultures were exposed to 2.5 μmol/l β amyloid peptide (1–42) for 5 days, resulting in about 40% cell death. The respective peptides were added together with the toxin at indicated concentrations (10-16 mol/l, 10-15 mol/l, 10-12 mol/l, and 10-10 mol/l). Experiments were repeated at least three times. Results were normalized by untreated cells. ***P < 0.001, cells treated with either NAP or D-SAL versus β amyloid alone (without peptide treatment). 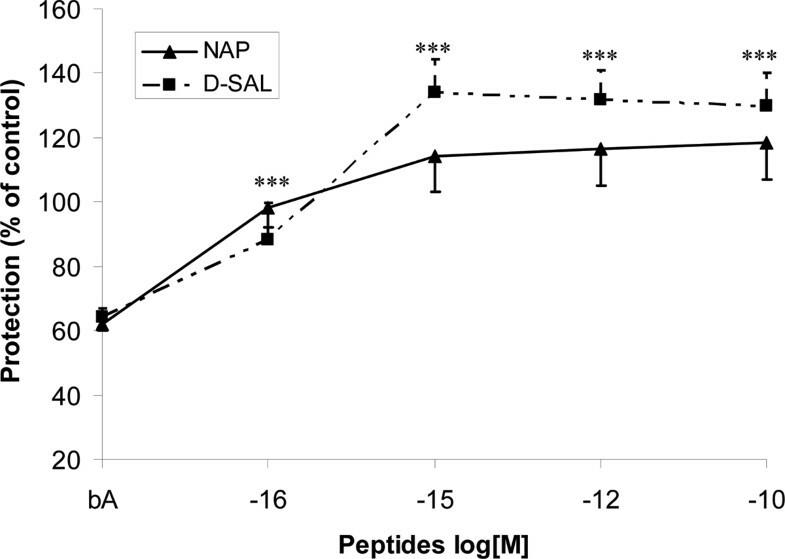 D-SAL, D-amino acid analog of activity-dependent neuroprotective factor 9; NAP, Asn-Ala-Pro-Val-Ser-Ile-Pro-Gln, single amino acid letter code, NAPVSIPQ, an eight amino acid neuroprotective peptide derived from activity-dependent neuroprotective protein. The β amyloid peptide (1–42) has been shown to aggregate into oligomers along microtubules of neuronal processes, both in Tg2576 mice and human Alzheimer's disease brain . In triple transgenic Alzheimer's disease mice expressing three mutant transgenes (amyloid precursor protein [double Swedish, K670M/N671L], presenilin 1 [M146V], and tau [P301L]) , β amyloid accumulation occurs before tau hyperphosphorylation. These findings have been suggested to imply, at least in part, a possible cause and effect relationship between β amyloid and tau pathology. A main target of NAP in neuroprotection appears to be tubulin, which is the major subunit of microtubules. Affinity chromatography studies utilizing immobilized NAP identified tubulin as the NAP associating protein . D-SAL diminished tubulin association with the NAP affinity column, suggesting an interaction of tubulin with D-SAL as well . Tubulin antibodies identified NAP interaction with the neuron-specific tubulin subunit β III, as well as with astrocyte tubulin . Further studies showed that although vincristine (which enhances microtubule depolymerization and crystal formation) did not diminish the interaction of NAP with tubulin, paclitaxel (a microtubule stabilizing agent) did diminish this interaction . NAP accelerated microtubule formation after nocodazole depolymerization in neurons . Furthermore, NAP prevented microtubule disassembly caused by zinc chloride intoxication in astrocytes  and in neurons . The temporal changes in microtubule assembly that followed NAP treatment in cells paralleled changes in phosphorylation of the tubulin-associated protein, tau . This finding suggests that NAP regulates tau phosphorylation alongside microtubule dynamics and protects astrocytes and neurons. In the triple transgenic Alzheimer's disease mouse model, NAP reduced tau hyperphosphorylation . Because tau hyperphosphorylation has been associated with major neurodegenerative diseases, including Alzheimer's disease, NAP holds promise as a neuroprotective/neurotropic drug candidate. Fluoresceine-labeled NAP was detected in the intracellular milieu of neurons and astrocytes. In astrocytes, labeled NAP was found even when incubated at 4°C and in conditions of low pH, indicating membrane permeability. Furthermore, comparison of NAP with known membrane permeating peptides has revealed that NAP possesses a membrane permeation structure . Because both NAP and ADNF-9 are active in their all D-amino acid conformation, these peptides were suggested to be mechanistically achiral . It is our working hypothesis that NAP interacts with intracellular tubulin to enhance microtubule polymerization and provide cellular protection. However, NAP interacts with specific tubulin subunits and does not provide protection to all cells. Indeed, NAP did not protect fibroblast-like cells, but did protect neuronal-like cells against oxidative stress . These results are in accordance with our original studies suggesting that NAP selectively interacts with brain specific tubulin subunits that are associated with multiple tubulin functions [30–32]. The pharmacodynamic compartment for NAP is the brain or the central nervous system. When NAP is administered it must be able to reach this target compartment at pharmacologically active concentrations. As shown in Figure 1, NAP exhibits an in vitro potency of about 10-15 mol/l. Preclinical and phase I clinical experiments demonstrated that intranasal administration of NAP to rat, dog, or human results in measurable plasma levels . After intranasal administration of [3H]NAP to rats, radioactivity was detected in the blood and was also measured in the various organs of the body . Intact peptide was identified in the rat cortex 30 and 60 minutes after intranasal administration. In the permanent middle cerebral artery occlusion rat model, intravenous administration of radioactive NAP resulted in measurable levels in the cerebellum and cortex 15 minutes after injection and was maintained for at least 30 minutes in ischemic tissue . Liquid chromatography mass spectrometry assays in rats and dogs corroborated and extended these results. Recent data from a pharmacokinetic study conducted in rats suggested a correlation between plasma and cerebrospinal fluid levels of NAP administered by intravenous injection. After intranasal administration in the rat, appeared NAP rapidly in plasma and the kinetics of appearance in cerebrospinal fluid (Tmax) appeared to lag plasma Tmax [14, 35]. It is therefore likely that access to the brain is via the circulation for both intravenous and intranasal routes. NAP and D-SAL protect against the Alzheimer's disease neurotoxin β amyloid peptide (1–42), which suggests potential treatments for Alzheimer's disease pathology. This finding, together with previous findings including animal efficacy and bioavailability studies, steer these compounds toward clinical development. Allon Therapeutics Inc.  recently released top-line results of a phase IIa clinical trial showing that its drug AL-108 (the intranasal formulation of NAP) has a positive impact on memory function in patients with amnestic mild cognitive impairment, which is a precursor to Alzheimer's disease. Asn-Ala-Pro-Val-Ser-Ile-Pro-Gln (single amino acid letter code, NAPVSIPQ). We thank the Allon Therapeutics Inc. team for excellent suggestions. Professor Illana Gozes is the incumbent of the Lily and Avraham Gildor Chair for the Investigation of Growth Factors, is the Director of the Adams Super Center for Brain Studies and the Levie-Adesheim-Gitter fMRI Institute, and heads the Dr Diana and Zelman Elton (Elbaum) Laboratory for Molecular Neuroendocrinology. Supported by ISF, BSF, NICHD, NIA, ISOA, and Allon Therapeutics Inc.
NAP and D-SAL are under patent protection and licensed for clinical development to Allon Therapeutics Inc. IG serves as the Chief Scientific Officer of Allon Therapeutics Inc.
IG conceived of the study, and participated in its design and coordination. IN and IP carried out the experiments. IG drafted the manuscript. All authors participated in writing, and read and approved the final manuscript.